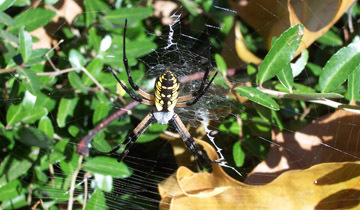 This was living in the bushes near my front door on Saturday morning. In fact, I think it's still there. Don't know if you can tell, but it's GINORMOUS. It's about the size of my hand. So, all you spider experts out there - what is it, or, how can I find out what it is? That is a Golden Orb Weaver, a common garden spider in the U.S.
She will help you, if you leave her alone, by eating lots of bugs. All spiders can bite, but these are not aggressive towards humans, so I wouldn't worry too much. So glad to hear that she's helpful and not harmful! And thanks for visiting!